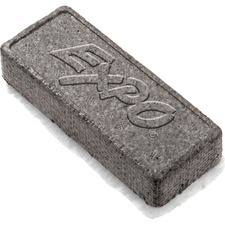 Expo® Eraser 5" x 2"
Specially designed for dry erase surfaces. Cleans with soap and water. Soft pile.5" x 2". Dual-ended design that gives you two colours in one marker. Low odour. Chisel tip.Assorted Fashion Colours.4/pkg. 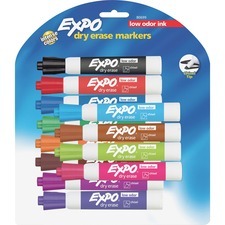 Dual-ended design that gives you two colours in one marker. Low odour. Chisel tip.Assorted Business Colours.4/pkg. Integrated magnet for convenient storage on metal surfaces and a handy eraser on the cap. Low odour. Fine tip.4/pkg. Integrated magnet for convenient storage on metal surfaces and a handy eraser on the cap. Low odour. Chisel tip. Integrated magnet for convenient storage on metal surfaces and a handy eraser on the cap. Low odour. Fine tip. 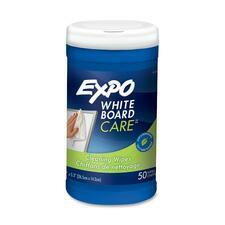 Pre-moistened towelettes clean and restore whiteboards by removing ghosting, shadowing, grease and stains. 5-1/2” x 10”.50 wipes. 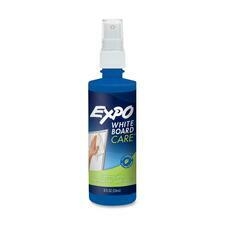 Removes stubborn marks and stains from dry erase surfaces. Pump Action Spray.8 oz. 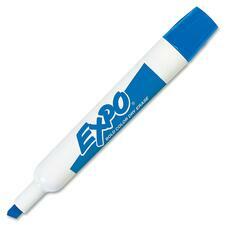 Water-based, wet-erase markers can be used on whiteboards and black magic boards. Conical tip.Assorted Colours.5/pkg.